Dream about squirrels | Welcome to Dreams.com! What does it mean to dream about squirrels? Dream: I dreamed of a black squirrel kissing my feet. DreamsMaster: Imagine you have to describe a squirrel to a child who has not yet encountered one. How would you describe it? What is its personality like? What traits is it known for? 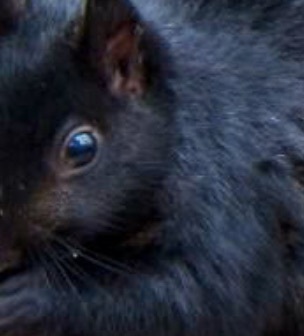 Is there something special to you about a squirrel that is black? The description you create will provide you with valuable insight for interpreting this dream. A squirrel darts around quickly, has lots of energy. It tends to spend much of its energy gathering and stashing away food, always preparing itself for the future. From my experience, squirrels are not very trusting, as they will immediately dart and leap up a tree the instant they catch site of someone in the vicinity. A person is referred to as being “squirrely” when they are flighty or dart around quickly like this. In the dream, the squirrel is not only calm and trusting, but is also expressing affection and gratitude (my projection onto “kissing”). Pulling all this together, if it were my dream, a squirrel kissing my feet could be a message to trust that I’ve accomplished much in the way of preparing for my future, and it’s okay to take a rest from my constant motion. On the other hand, if the dreamer is someone who has not taken steps to plan for a future and is not very active, a squirrel kissing the dreamer’s feet could represent one’s subconscious mind trying to rouse the dreamer to action.